Peptides are the building blocks of the natural world; with varied sequences and structures, they enrich materials producing more complex shapes, scaffolds and chemical properties with tailorable functionality. Essentially based on self-assembly and self-organization and mimicking the strategies that occur in Nature, peptide materials have been developed to accomplish certain functions such as the creation of specific secondary structures (a- or 310-helices, b-turns, b-sheets, coiled coils) or biocompatible surfaces with predetermined properties. They also play a key role in the generation of hybrid materials e.g. as peptide-inorganic biomineralized systems and peptide/polymer conjugates, producing smart materials for imaging, bioelectronics, biosensing and molecular recognition applications. 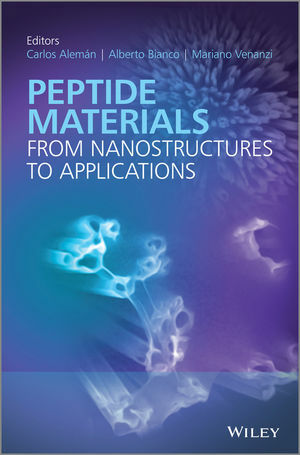 Peptide Materials: From Nanostructures to Applications gives a truly interdisciplinary review, and should appeal to graduate students and researchers in the fields of materials science, nanotechnology, biomedicine and engineering as well as researchers in biomaterials and bio-inspired smart materials.